There is so much snow out there. Yesterday’s snow added up to a foot or a little more. The big winners were Rhinelander with 14.5, and the New London area with 14″. Townsend reported 12.5, Lakewood 12″ and I am in the 12-12.5″ range here in Silver Cliff. I will measure again tomorrow but the ground depth of the snow is now getting close to 30″. The late winter sun in March ( only a couple of weeks away!) might hurt road trails and sunny spots, but this snow pack will survive a long time. It is not a puffy 30″, it is sturdy stuff. That brings us to places that it is a problem. The roofs are my #1 concern. I will be doing more shoveling tomorrow around here and there is a lot to do. In the driveway I have about a 150 yard stretch that I am doing with the snow blower now. The piles are chest high and the plow truck can’t throw the snow that high. The snowblower can throw it over the piles. When I snow blow the yard paths to the wood shed, work shed, etc the muffler blows the snow on the sides of the path back and ices up the carb on the snow blower. I had to use the heat gun about 5 times today to defrost it. Satellite TV and internet dishes need cleaning too. Beyond the challenges that come with the snow is a taste of paradise. The trails will not be out of snow anytime soon. I am looking at the 7 day forecast on TV and it all looks very comfortable for riding. The road trails have plenty of snow too. There are good conditions system-wide. To make it even better, gas is fairly cheap at about $2.20 for regular and under $3 for premium. This is what we have been waiting for. Not bad for an El Nino winter. We have some events coming up this weekend. 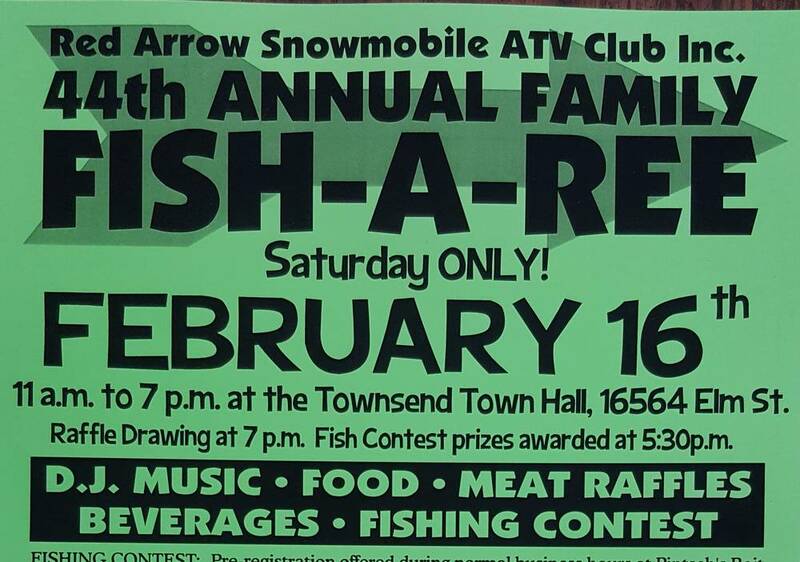 First up is the Townsend Red Arrow club’s Fish-A-Ree. 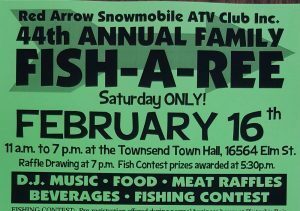 I heard that there is also a fish-orama type event in Crooked Lake this weekend. -Update.. This Saturday is also the 7th Annual Human Ice Bowling at Thorntons. I do not see much for snow coming in the next couple of weeks on the GFS model. Thankfully I don’t see any big warm-ups or brutal polar weather either. I sure wish that I could store some of this and use it in the hard times. Have a good Wednesday and thank you for visiting!